Are you experiencing Dizziness or Balance Issues? You need a medical professional you can trust when it comes to vestibular disorders. The audiologists at Midwest Dizziness and Balance Institute have the background and experience to provide you diagnoses and treatments that will bring wellness to your life. We are an all-in-one specialty clinic treating dizziness, vertigo, balance issues and other vestibular impairments. If you or someone you know are experiencing these health concerns, feel free to contact us to set an appointment. We look forward to seeing you soon. Our comprehensive 3.5-hour assessment evaluates your entire vestibular system in order to get a full picture and figure out what is causing your dizziness, vertigo, and imbalance. After your assessment and diagnosis, we will discuss our findings and decide what treatment is right for you. Once diagnosis is complete, we use Advanced Vestibular TreatmentTM to treat dizziness, vertigo, and imbalance disorders to bring balance back to your life. Treatments can range between 1 to 12 visits, may include home assignments to assist in your recovery and are specialized for each individual. Providing patients with the appropriate diagnosis and treatment has always been our commitment. Our state-of-the-art facility, partnered with our highly trained vestibular audiologists, are what you should trust for all your inner ear concerns. Let us properly assess, diagnose and treat your vestibular system utilizing our knowledge along with the best equipment. We'll evaluate your entire balance system and provide the appropriate treatment for you. Self-referrals as well as physician referral are accepted. 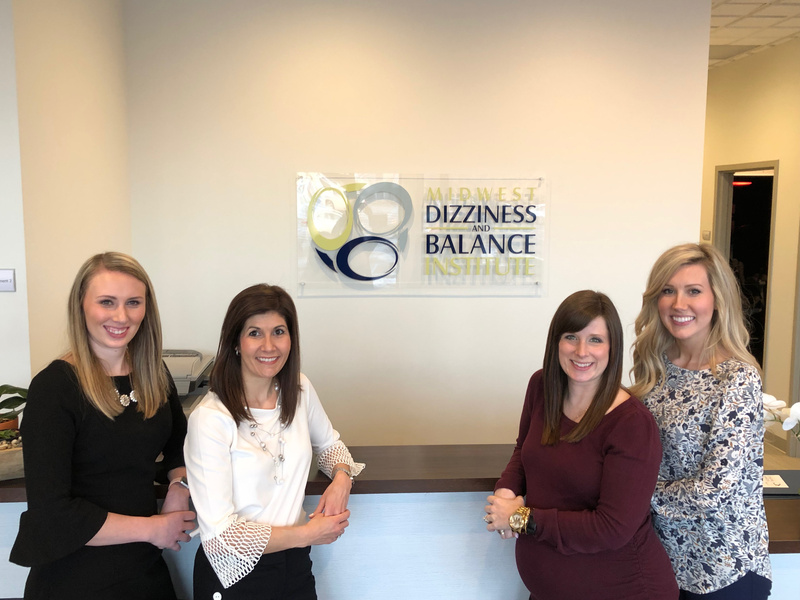 We hope Midwest Dizziness & Balance Institute is your first and last step in bringing your life back into balance. I have a long history of vertigo related to BPPV and usually could get relief from my ENT. This July I was incapacitated by the most severe episode I had experienced. After unsuccessful relief after three visits to the ENT I was referred to the Dizziness and Balance Clinic. Jaime’s kindness, understanding, and compassion put me at ease. She thoroughly explained every step of the testing procedure before each one was performed. With her expert interpretation of the test results she knew exactly what was necessary for relief. The first treatment went better than expected, although not quite completed. I was sent home with thorough instructions of exercises to do until our next appointment. When that day came I was a new person. Jaime saw it immediately. Jaime explained the physiology of the crystals in the inner ear as related to BPPV in less than 60 seconds. I have read dozens of articles and studies but none made it as clear as she did! Her knowledge, kindness, compassion, and genuine concern for me as an individual, have cemented me to returning to her for any needs in the future. No more going from one place only to be sent to another, etc. I will continue with the continuity of care Jaime Carmody offers. After seeing my primary care physician, a cardiologist and then an ENT, I was referred to Jaime for my vertigo. After a thorough evaluation, that was honestly much better than what I had anticipated, Jaime was able to locate where the dizziness and vertigo were coming from. After 2 treatments, I was dizzy free and felt so much better. I haven't had any episodes for 6 months and I am so grateful that I found her. I have had multiple episodes of vertigo problems. Jaime's professionalism and calm demeanor helped relieve my distress. In each episode, she accommodated my needs and fit me into her schedule. Knowing I have her to call should my vertigo return is immensely reassuring. We accept appointments from Monday to Friday. We accept all types of insurance, including Medicare.